Outside the wide world of popular culture, you can sometimes find yourself captivated by a niche genre. Maybe you’re into Man vs. Nature stories à la Sharknado. Perhaps you love a Fractured Fairy Tale, or an elegiac Space Opera with a million different alien races and religions. Me? I will fall hard for anything from the Overdramatic Computer Hacking genre. Those terrible 3-D renderings of computer security from ’80s movies like Weird Science? I adore them. The decking sequences in Shadowrun? They look amazing, even if I’m terrible at them. If I ran the world, the movie Hackers would be a documentary and stopping a program in Windows Task Manager would be like a scene out of Tron. My point being: I am 150% in the bag for faux-technical computer tomfoolery, so a game like Mainlining should be a slam-dunk for me. Developed by Rebelephant [Editor’s note: what a name!] and partially funded on Kickstarter, Mainlining puts you in the shoes (and at the desktop) of an agent for the government spy directorate MI7. Your job is to investigate a potential ring of cyber criminals, using any hacking tricks you can manage, with the goal of building cases and getting arrests. 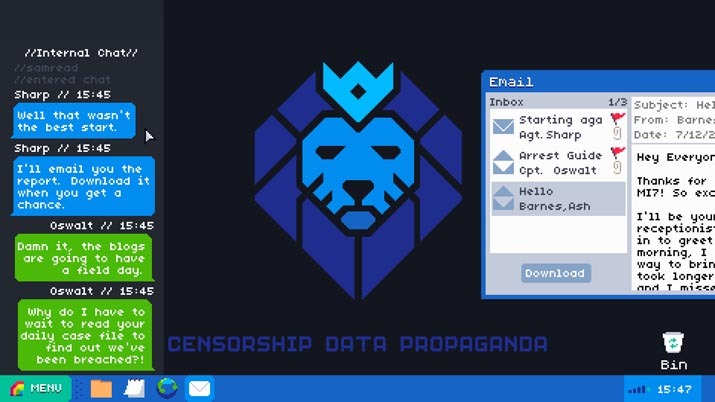 Mostly, this involves downloading files from other people’s computers and phones, looking things up on the internet, and supporting field agents by following their missions on a virtual map. My favorite part of Mainlining is the aesthetics. The game ostensibly takes place in 2010, but the graphics are a pixelated version of an off-brand Windows computer. It’s simultaneously modern and retro, like what would happen if you could boot your 2017 hard drive on a Macintosh II. The effect is a certain timelessness that makes Mainlining feel like it takes place in its own cohesive world. This might be because of my personal history with computers – my first PC gaming experiences took place in MS-DOS, so I don’t know if the graphics will connect with someone who grew up in, say, the early 2000s the same way – but Mainlining scratches my nostalgia itch in a way the doesn’t feel cheap. As a plus, Mainlining is brimming with technology jokes, from your default web browser “Discoverer” to a gag about turn-of-the-millennium web design so hideous you might literally throw up. In terms of gameplay, Mainlining is essentially a point-and-click adventure. There’s some typing involved, but the core of what you’re doing is looking through various items and seeing what you can put together to advance the story. While it can be fun to snoop through the digital lives of strangers and find out how everything is connected, the actual mechanism for getting an arrest is a bit underdeveloped. You build cases by linking a suspect, a location, and one (and only one) piece of evidence. In true point-and-click fashion, it can be very frustrating getting the combinations right for an arrest. There’s sometimes so much overwhelming evidence that it’s hard to figure out which piece the game will accept. Other times, the evidence feels very sequential; this guy’s username is this, that username is selling an illegal substance on this website, that website has made deposits into the guy’s bank account; and it’s difficult to choose which piece of evidence is the smoking gun. Each case has a few different solutions (either different suspects or different crimes), which helps a little bit, but overall the arrest system feels too rigid. I definitely sent one or two people to jail based on trial-and-error guessing. There also isn’t much in the way of a help, or hint, system. Occasionally, other MI7 agents in the internal chat app will point you in a general direction, but there aren’t any definite hints. I’m not proud of it, but I resorted to YouTube tutorials to get me out of a few jams – usually because I overthought the problem, or because the game’s mechanics had inadvertently steered me off course. 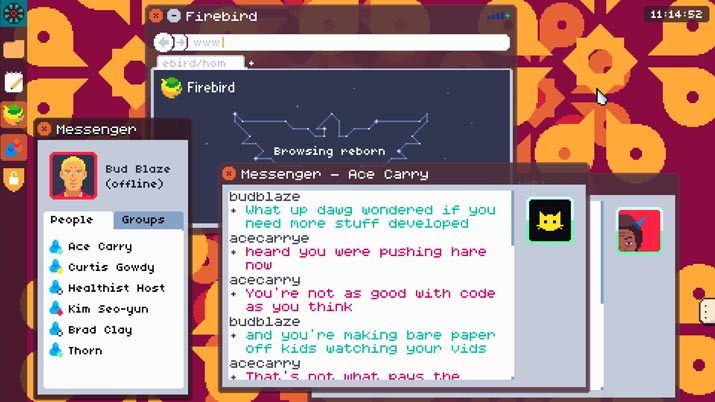 For example, I missed a clue because I couldn’t figure out how to scroll in the game’s instant messaging window. Unlike all the other windows, the scroll bar on the side of the messaging window was disabled; instead, I had to use my scroll wheel to scroll. I mean, a mouse contemporaneous with the graphics style of Mainlining didn’t even have a right click button, much less a scroll wheel! I should have known better than to just assume you couldn’t scroll through those windows, but Mainlining didn’t give me a lot of support when it came to overcoming my stupid mistakes. Mainlining is a perfectly serviceable spy story, and it’s fun to see how the larger plot comes together as you build on your knowledge from case to case. The characters are amusing, but not uproarious. Only the first seven cases were released on day one – the rest of the game is coming February 2 – so it’s difficult to make a definitive judgement, but I’ll say this: the story is good enough that I’ll keep playing when the next part comes out, but absent the ability to get immediate help from the likes of YouTube, Mainlining risks being more frustrating than it is entertaining. On a closing note, for a title about government surveillance, Mainlining is not terribly political, which is a relief. In the current political climate, I’d rather my hacking games be entertaining and goofy than thought-provoking and moralistic; I have enough trouble sleeping as it is. 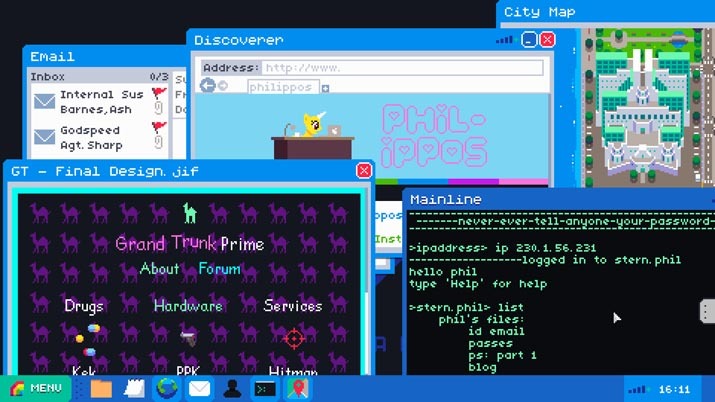 If you’re a fan of the genre (or want the power-high that comes from hacking, without putting forth the effort to be actually good at computers), Mainlining is a fine choice. It isn’t a home-run, but it’s fun to look at and fun to play, even when it gets a bit frustrating. If you’re put-off by having to do a lot of reading in your games, though, it’s probably not for you.